You can still be colorful WHILE incorporating like black or a very very very dark purple or like have metallic ponies. I'd love that! Just some color scheme out of the pink pastels. I am NOT a fan of pink. I know. I'm just saying that I don't like purely realistic colors on MLP, FSF and FF. Conversely, Breyer decos bother me. With like 2 sole exceptions. I think of getting a striking deep purple or blue pony with a stripe of black through their mane with other blues or purples... beautiful! Or a pure white pony with Red and black for mane/tail. Stunning! I'd love to see black used. 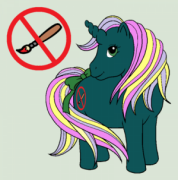 I'd love to see bacl ponies with bold manes as well. A jet black pony with midnight blue mane with a bold streak of white! Yassss! And as for unpopular opinions... I like Newborn Cuties. Neigh! I LOVE THEM!!!! While the G1s are nostalgic, and the G3s are classier G1s, my favorite gen is actually G2. I love their cute and slim look and their crystal eyes, even if said gems have a tendency to fall out easily. I like G2’s as well. Especially the babies, I kinda wish they were easier to find thrifting though. I won’t spend much on them. Yet. I'm actually not that into the G2 babies surprisingly. My favorite babies will always be the chubby G1 ones. I don't like G4 Rarity as a character. She reminds me of Truly and her color scheme is eh. I don't like Truly much either as a character or toy. I've never been fond of her dark pink hair. I don't like Firefly, her pose is what kills it. I like Beddy Bye Eyed babies, especially beat up ones with rusty eyeballs. They look like little haunted monsters, they're fabulous! I have an unpopular opinion, why have ponies in my little pony, why not eggs or rocks instead? I don't like the Firefly pose either. It makes ponies look too chubby, especially for Pegasus ponies. Because eggs eventually start to stink. And you can't brush rocks luscious hair. They'd make excellent melee weapons though. Or should I say EGGcellent? And you can't brush rocks luscious hair. Asbestos is a stone that in its natural state has hair. Rocks are weird. There's on called pumice that floats. Back on topic, I don't like most pony names. They're too sickly sweet even for girly pony toys. Mountain Boys are awesome, but I do not love Lightning and Fireball. I think G4 did wings best. G1 looks like corn on the cob lol. All MLP is Girly. G4 is no less girly then its past incarnations. I've revisited Tales and it holds up better then people give it credit for. I like the Tootsie pose. Its cute. I'm not much interested in blindbags, petites, ponyvilles. The tiny tins are am exception. I'm not as fond of the G3 Unicorns. So many great designs and we got stuck with 8, mostly with boring colors and symbols. There are a few standouts however. I like the G4 merponies. I will never call them sea ponies because they aren't. I don't care about preserving curls. I can't stand the term pony cancer and I refuse to call it that. I like the second set of princesses a lot. I'm not much interested in blindbags, petites, ponyvilles or tiny tins. 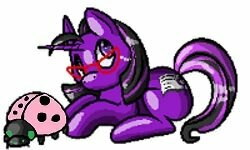 Bushwoolies and Spike are best pony sidekicks. Mr. Moochick is the best. Paradise Estate is the best playset AND home for the ponies. Pony wear is still frustrating. Maybe even more as an adult. Where did all the pony shoes go!?!???? You know the ones. When you see a mini eqg set with rarity and pinkie pie is the other doll. I like the weird G1 mer-pig-ponies. I don't like Mimic, she's the color of lima beans and the open mouth looks doofy. The collector pose ponies have dumpy butts. I don't like how pretty much every generation makes the figures smaller than the previous one.